First let’s talk about the filling. The standard filling comprise of minced meat with some vege accompaniment. The usual choice is pork though ground chicken can also be used. In some parts of China where the Muslim minority groups form the prevalent community, lamb is also used. If you use pork, it is good to buy some with good fat ratio. 70% meat to 30% fat is the classic textbook proportions but you can adjust it to your own liking. Just tell the butcher than you want minced pork which is slightly fatty. If you are up for it, you can always buy a slab home and mince it up yourself with a good Chinese cleaver. If you wish shrimp can also be added but do note that shrimp cooks a lot faster than pork so you may have to adjust the ratios of the meats so that one doesn’t get overcooked too much while the other is still pretty much raw. I won’t go into the details of that in this post. Next is the vege components. Lots of choices here but my fav is Chinese chives aka 韭菜 and spring onion. Their pungency and strong flavours nicely works up one’s appetite. You can also use greens like bak choy, shanghai greens, long stem mustard, chinese spinach etc but those need to be lightly blanched and squeezed dry before they are added into the filling. 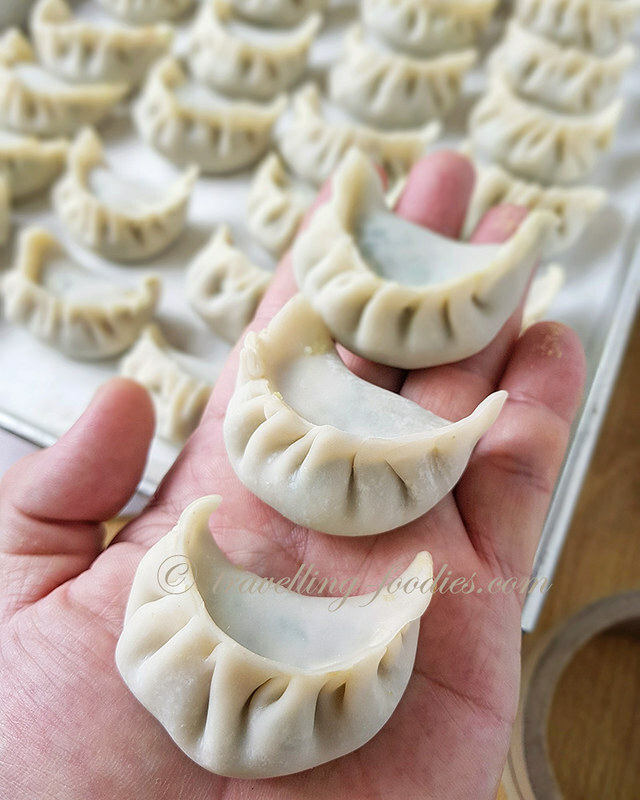 You can also go with napa cabbage or even some gourds when they are in season but they would have to be slightly salted and again squeezed to remove excess moisture before incorporating into the filling. Otherwise, mushrooms of assorted variety are good too, from the usual shiitake to shimeji and if you are up for it, matsutake, maitake, porcini or even truffle! The important thing is not just what goes into the filling but how the filling is put together. 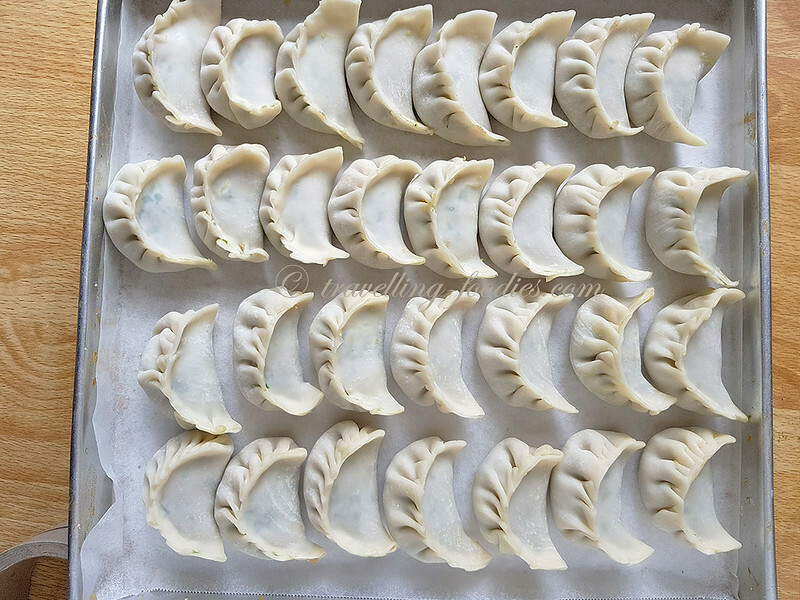 It is not just a case of mixing all the ingredients together but one would require a certain amount of elbow grease to whisk the filling with a pair of chopsticks or repeatedly slap the filling against the mixing bowl until it turns starchy on its own. If one is in a rush for time, a little cornstarch will be of help as well. Next let’s talk about the making of the dough. When I do have the time to make my own dough, I like to use a ratio of 2:1 for plain flour to tepid water. The water needs to be heated up to around 60-70C before being added to the flour in a mixing bowl. It is then a game of kneading until the dough is smooth and then left to rest for the gluten to relax before dividing the dough into portions and flattening them with a rolling pin. If you are lazy like me, storebought ones are good too. The Japanese supermarkets here like Meidiya and Isetan Scotts offer really good ones imported from Japan. 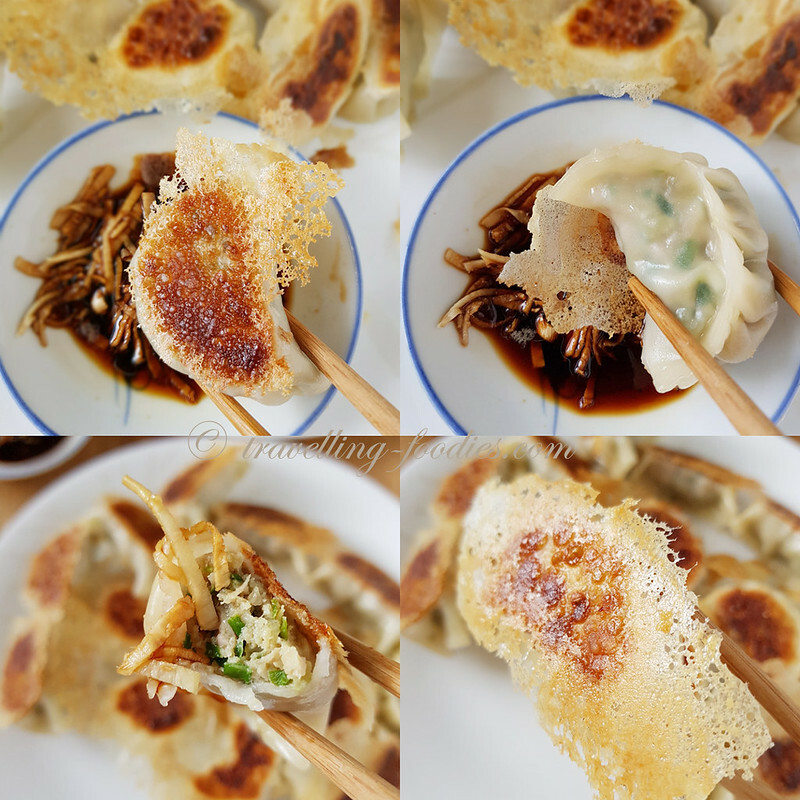 Otherwise some local noodle companies also produce reasonably decent dumpling skins and are labeled as “台湾饺子皮“ or “上海饺子皮“. Do make sure you buy the correct one though. The skin should be beige white and not those yellow ones with eggs added for wrapping wantan, siu mai or shuei gau. After that is the wrapping. The wrapping part takes practice to get it right. Do not be obsessed with creating too many pleats. Do not be greedy to pack in too much filling. General rule of thumb is one slightly heaped teaspoon of filling in the middle of one piece of round skin. Give the filling a gentle press to make sure that it is snugly packed into the centre before proceeding to bring the two sides together. This is to prevent any air pockets from being trapped both between the ball of filling and the skin, as well as inside the filling itself. The trapped gases would expand during the cooking process which may cause the skin to burst. That said, be sure not to press too hard as well in fear of tearing the skin even before the dumplings are cooked. I like to use eggwhites to seal the dumpling edges though regular tap water would do the trick as well. If you don’t wanna waste cracking an egg just to use it to seal the edges, you can use the 胶 that forms when the meat filling is thoroughly mixed and coats the sides of the filling bowl to seal the edges as well. Now the cooking process. The simplest way to cook the wrapped dumplings is of course to boil them in water. Otherwise, they can also be deep-fried, pan-fried, air-fried, steamed etc. My favorite way of cooking them is a partial pan-fry and then steaming method. 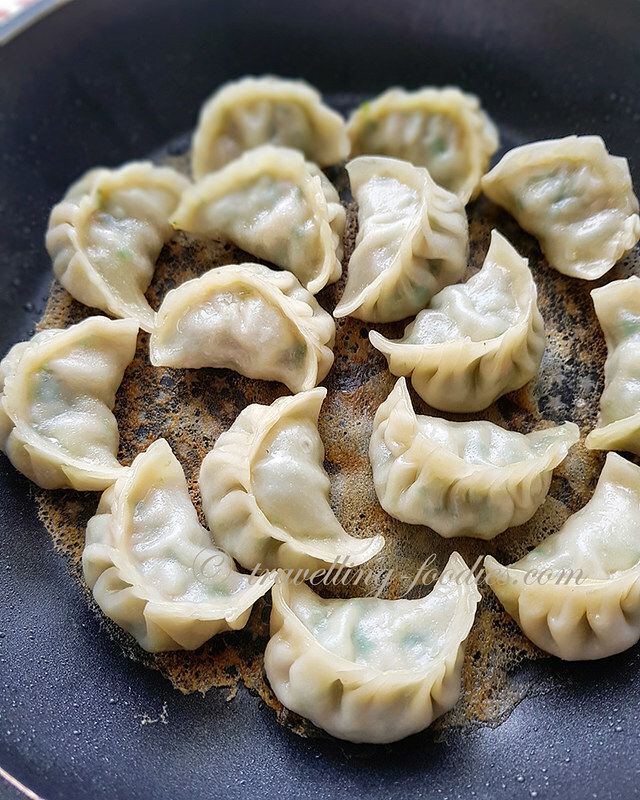 The dumplings are first laid in a flat non-stick saucepan which has been coated with a very thin layer of cooking oil, with slight gaps between them. Don’t pack the dumplings too close or the skins might stick to one another causing them to rip later on in attempt to separate them. You won’t be able to get the good 羽根 or 冰花 effect too if the dumplings are packed too close. 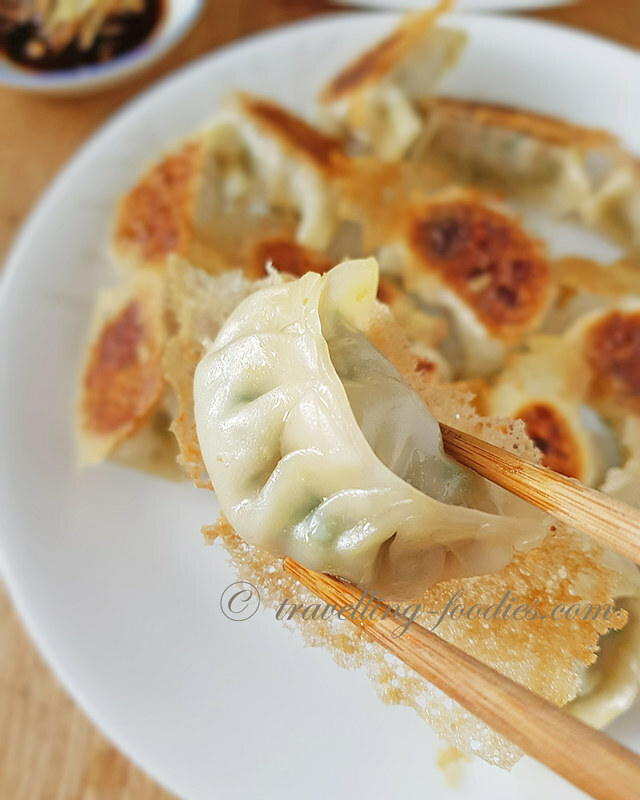 The dumplings are then gently sauted until the undersides of the dumplings have become lightly browned, a starch slurry is then carefully poured over the dumplings which will trickle down and sparsely fill up the gaps between them. The ratio I like to use with starch to water is 1:10. That is one part plain flour to 10 parts of water. Work with tablespoons and not in cups! You may or may not use up all the slurry mixture depending on how wide your saucepan is and how close the dumplings are placed. This part that requires practice as well to work out what amount works best with the kitchenware you have. I like to drizzle a bit first and then a couple of minutes later drizzle somemore on those areas which have not form the lacy effect yet. Do not be too zealous and pour in everything all at once as the layer may become too thick. Finally for the dip. The gyozas are good on their own but a good dip would help elevate the palate sensation when enjoying them. It is a very simple dip which I make at home. Basically it is just julienned young ginger added with black glutinous rice vinegar 老陈醋, light soya sauce 生抽 and chili oil aka 辣油 la yu in equal proportions. 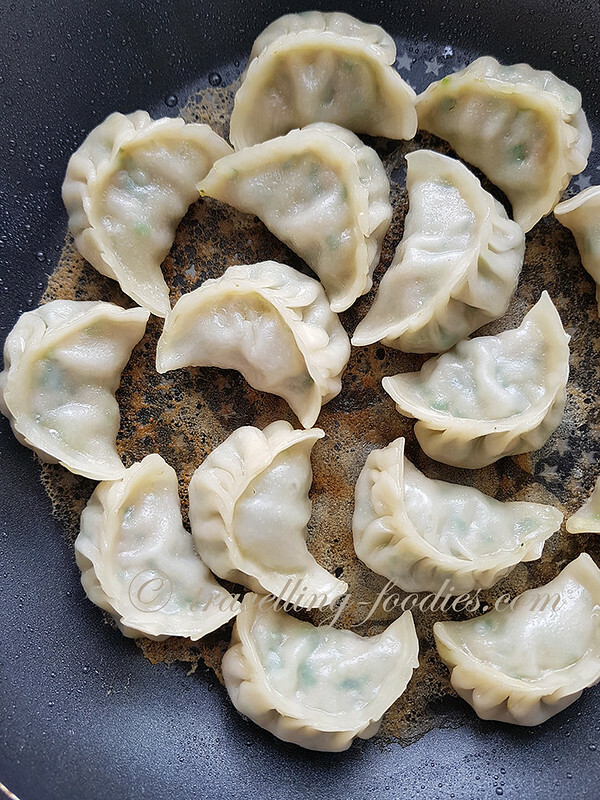 You can improvise and add your own favorite ingredients like chopped spring onions, chopped coriander, garlic, 老干妈 chili paste etc of course but don’t forget that the main lead are the dumplings and not the sauce. Add water 1 tbsp at a time with thorough mixing between to ensure that the water is thoroughly absorbed. There should not be moisture pooling on the sides or at the bottom of the bowl. Set aside to marinate for at least 30 min. To wrap the dumplings, first place a piece of skin on your palm with the smoother surface with lesser dusting flour facing upwards. Pack a generous tbsp of filling in the middle and use the back of the spoon to gently press the filling against the skin to expel any trapped air. Run half of the perimeter of the skin with a thin layer of water or eggwhite and proceed to bring the two sides together to seal. Pleat in whichever pattern which you desire. Lots of youtube videos you can refer for the ways to pleat dumplings. In a good non-stick flat saucepan, drizzle and coat the surface thinly with some cooking oil. Place the wrapped dumplings into the pan leaving at least a finger width gap in between them. Turn on the heat at medium low and saute until the undersides turn light golden brown. Carefully drizzle the starch slurry over the dumplings. Be sure to give the slurry a good stir to homogenise the mixture before pouring. Be careful as pouring the slurry may cause the pan to sizzle and some oil to splatter. Cover the pan and turn the flame down to the lowest possible for your hob but maintaining heat in the outer ring to ensure that the dumplings placed near the edge of your pan get cooked as well. Leave to cook for around 4-5 min. Remove cover and drizzle some more starch slurry over the dumplings, especially around the area where the lacy layer has yet to form. Cover again and cook until the base has completely dried and crisp up. Carefully dislodge the layer from the base with a spatula if necessary. Turn off the flame, place a large flat plate over the top of the dumplings and invert carefully. Enjoy the hot dumplings with the dipping sauce made by mixing the light soya sauce, black vinegar, chili oil and julienned ginger. Hope you all will like the recipe and tips provided above. Happy trying! 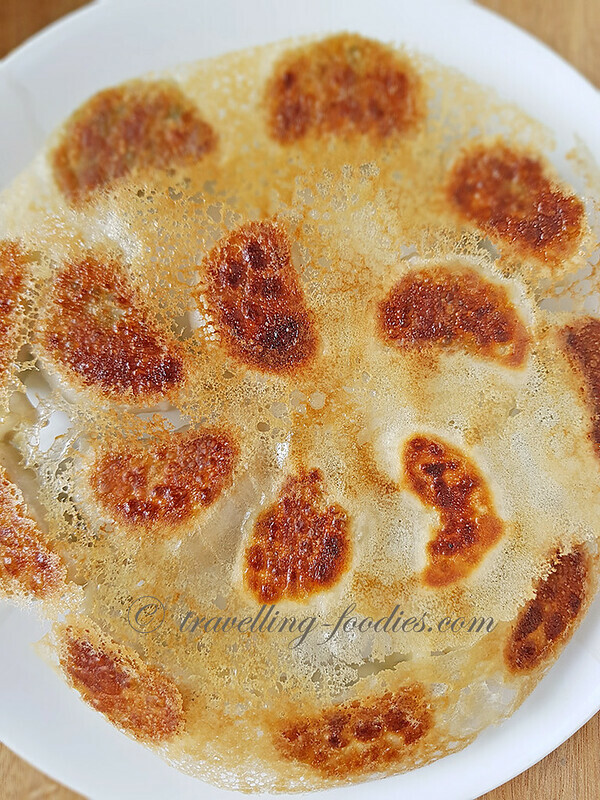 This entry was posted on September 20, 2018 by Alan (travellingfoodies). 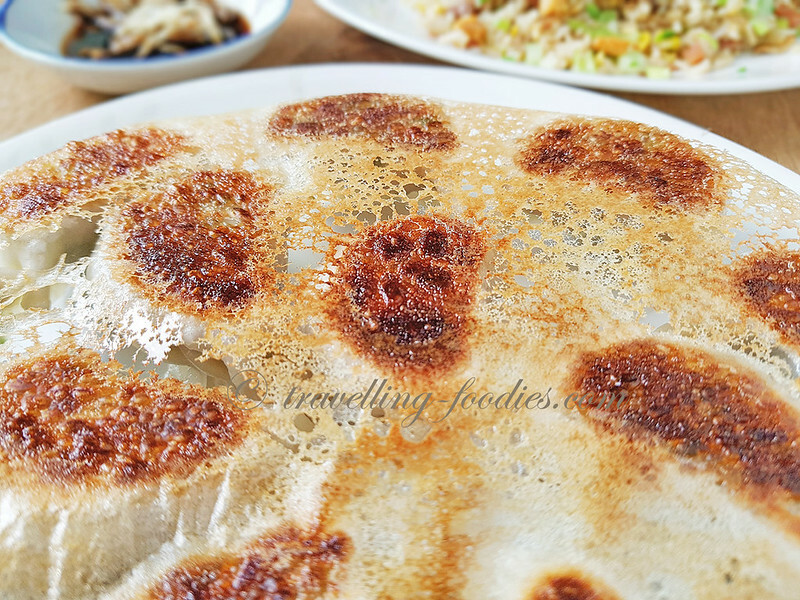 It was filed under Food, Simple Eats and was tagged with 锅贴, guotie, hanetsuki gyoza, 冰花煎饺, 中华料理.